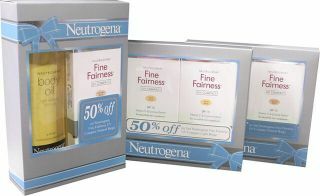 Neutrogena actually offers great discounts now when you buy Neutrogenaâ€™s Fine Fairness UV Compact and Body Oil. I am so happy to know that they are on sale now for the holidays!Â You can actually buy two (2) Neutrogena Fine Fairness UV Compacts, with the second compact at 50% off (bargain price of PHP 1,063.59)Â Also, you can buy one (1) Neutrogena Body Oil an d one (1) Neutrogena Fine Fairness UV Compact (at half its original price) for only Php 939.50!! !Â Grab one for yourselves and for your favorite ladies within the promo period of December 1 â€“ 31, 2009. Available in shades of natural and light beige, the Neutrogena Fine Fairness UV Compact is clinically-formulated to blend evenly with the skin tone and provide beautiful, natural-looking coverage. Its Vitamin C and Licorice Extract plus sunscreen protect the skin from the sunâ€™s harmful UV rays, preventing sunspots and premature skin aging. The Neutrogena Fine Fairness UV Compact is hypoallergenic, fragrance-free and does not clog pores. It is also resistant to humidity, sweat and oil, thus, giving the skin lasting coverage needed for all the merry-making this season. With its light sesame formula, the Body Oil is easily absorbed by shower-damp skin, leaving it soft and silky with a radiant and healthy glow. And with Christmas just around the corner, you only need a few drops of the Neutrogena Body Oil to keep your skin hydrated and moisturized amidst the cool holiday breeze.